This is a construction article for the venerable ESCI M3 Scout Car 1/72-scale model kit previously released by ESCI and recently released by Italeri. In 2012, Ken Overby released a spiffy conversion set in cast resin so as to convert the plastic model to an M3A1 version, which represents the vast majority of Scout Cars that were manufactured by White Company during WW2. For an in-box preview of the plastic kit and Overby’s resin conversion set please see here. Above is a photo of an old ESCI M3 Scout Car that I built out of the box many years ago, one of the first small–scale models I ever built. In this and the lower three photos let us see what features it has, and what is right and wrong with it. We can see the gun skate rail that goes around the interior, typically holding up to three machine guns. There is a gap under the armored windshield that I do not think should be there. The fuel cans are simplified with a single handle rather than the correct three handles. In this photo of the out-of-the-box M3 Scout Car we have a good view of the gun rail that was also used on early M3 Halftrack. There is a large canvas wrapped around the front section of the rail; I suspect this is the canvas cover for the vehicle. There are rolls of cloth also wrapped around the rail above the side doors; I suspect these are here to protect the driver and passenger from painful bumps on their heads. There is stowage that comes with the kit on the rear bumper that appears to be magnetically affixed. The machine guns looked great to me when I first built this model but right now seem very simplified; Ken Overby’s machine guns are considerable better. The vertical rod rising from the floor is for a radio antenna, but no radio set is included with the ESCI model. Here we see the underside of the ESCI model with the drive shafts going to both the front and read axles indicating 4-wheel drive. There is a muffler and tail pipe included which is good, but no cables or steering rods. I think the rear axle is mounted a millimeter or two too far forward. It is important when assembling the new resin wheels that we get them located correctly and mate them with the kit parts correctly. 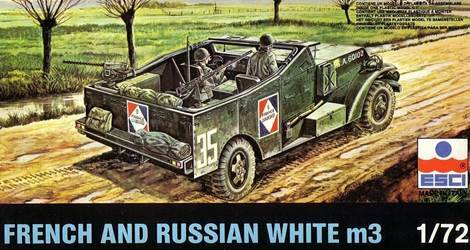 The Scout Car armored body is assembled from kit parts, but leaving out the crew seats. One of the kit parts, a thin wall between the driver area and the cargo compartment, was replaced by more in-scale white plastic card. The brake and gear shift levers were replaced by wire and plastic levers. Some of my styrene parts were warped so they had to be assembled in stages and clamped together till the glue dried. Both the frame and the body suffered from warped plastic parts so had to be glued and clamped in stages till the glue set. I left the kit radiator off the frame as it is unseen when the model is assembled and actually got in the way of the resin replacement part for the louvers. The kit underside was largely assembled out of the box except for some scratchbuilt details for the steering mechanism and bolt details. Overby’s replacement wheels have considerable nicer tire tread detail than the original kit tires. Jumping ahead, the radio has been raised up on a base based on historical photo of an M3A1 with a radio installed in this location. 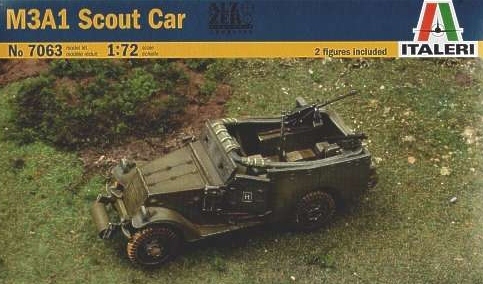 I have four photos of the Scout Car carrying radios and they all have the radio mounted in a different way or location. One middle seat was left off to make more room for the radio operator. The doors are nice and thin and great detail inside and out. Here one is portrayed with the upper armored window raised and on the driver’s side the window is lowered. On the dashboard the dials are drilled out deeper to better accept paint and Krystal Klear to simulate glass. Comparing the machinegun skate rail to preserved M3A1’s I believe that Ken Overby’s rail fits too tight to the inside of the armor hull; there is supposed to be a gap where brackets attach the rail to the hull. Considering the overly thick side armor I think his approach is a fair compromise and I have no problem with the lack of a gap. A test fit on a base. In order to handle the model with less chance of breaking off small parts with my fat fingers the Scout Car is glued to a base made from a small chip of Formica sample built up with sculpted foam to represent a dirt road. The bottoms of the tires were sanded flat a bit to represent weight upon the tires. The rolled tarp wrapped around the rail above the driver’s door should go all around the rail and there was often one above the passenger’s door as well. The machine guns are left off till after painting so they don’t get accidentally broken off. This photo shows well the two Scout Cars, an M3A1 at left and an M3 at right, prior to painting. Though intending to build the M3 version out of the box I could not resist a few improvements: the headlight bumps were shaved off, the old decals scraped off, and rolled canvas was simulated over the driver and passenger doors. On the M3A1 the painting will be done before the glass windshield will be simulated. On the M3A1 at left a good view of Overby’s machine gun tripods mounted on the rear below some canvas cover supports made from brass wire. Tie down straps were simulated with tape. On the M3 at right I’ve added some foil to improve the look of the rear window flap. The M3 appears overall lower because of the original ESCI kit wheels are smaller than Ken Overby’s resin wheels. Jumping ahead a few steps, the M3 has been painted in olive, with a dark point wash and a light coat of OD. ESCI kit decal marking for a French Army Scout Car serving in Northern Europe are applied over a clear gloss coat. Red-brown paint has been applied to the tire tread. At this point a dusting of wet pastel powder has been applied. Much of this powder will later be brushed off and blended in to a softer edge. The vehicle edges have been lightly highlighted. Behind the ESCI kit brushguard we can see the new, scratchbuilt headlights produced from styrene rod. The M3A1 with Overby’s resin conversion parts, painted and with decals but waiting on the clear dullcoat and weathering so the hull matches the groundwork. You’ll notice that one of Overby’s machine guns has been replaced by a Russian Maxim gun, my attempt to make the M3A1 look a little more Soviet. I have no evidence that this machine gun would actually mount on the US machine gun mount. The open engine louvers we get with Overby’s conversion set is for me the best part. Note the three rods holding up the armored windshield. I found the Cpl Overby Motor Pool’s resin parts did not hold the acrylic paint well even though I thought I washed it well in dish detergent. Perhaps there is residual mold release lubricant and next time wiping the resin parts with lacquer thinner would help the paint adhere better? A clear acrylic dullcoat spray has gotten rid of the glossy decal area. Pastel powder added for weathering has not yet been blended in and the edges softened. I typically don’t go in for complicated weathering for my own personal reasons. Fini ! A significant thing I do not like about the model is that the rear wheels seem too far forward in the wheelwell, which is also a characteristic of the Scout Car I built many years ago so I conclude this is an error with the kit. If I ever build another one I’ll modify the rear axle to sit further back, which also requires me to make the drive shaft longer. Overby’s machine guns are an excellent upgrade to the ESCI kit. The old ESCI kit decals slid off the paper easily and settled down on the model well with a little decal solvent. When weathering remember to add soil to the floors where dirty boots would set. The machine guns and periodic edges were rubbed with pencil graphite to simulate gunmetal and worn spots respectively. The decal film seems to have disappeared pretty well (?). The seats, tarps and stowage were given different shades of OD from the Scout Car body to make the vehicle less monochromatic. Hanging off the rear is the Soviet Maxim machine gun mount tied on with some simulated rope. Overall I am pretty happy with Ken Overby’s conversion set and the final model. I would not build another Scout Car without a nice detail set like this one. The kit’s warped body parts made assembly challenging and unfortunately resulted in the body still being a little warped when complete so it would not sit flat on a table. Some crew figures will be added later, partly to help protect parts of the model like the doors from accidental damage by clumsy handling. Hmmm, it also looks like I should paint in the red tail lights?